Independent property valuers Herron Todd White say that the Brisbane apartment market is about to enter a decline. It looks like values will go down. We have not had a boom in Brisbane since 2007. Who said property prices double every ten years? If you bought in 2007, you may still be underwater! "Brisbane property has been a heartbreaker over the past few years, offering so much promise, but failing to live up to the hype – and anyone hoping 2017 would prove to be “The Year of the Brissie” will probably be disappointed again. The hoodoo continues to be employment-fuelled interstate migration and, truth be told, we can’t see anything on the economic horizon to suggest southern buyers will start heading here in droves. That’s not to say we should be ignored - on the contrary, Brisbane is one of the country’s most forgiving capital city markets. There are very few disappointed long-term buyers in our sunshine- state’s big city, provided they stuck with the fundamentals and bought the right property in the right position at the right price. 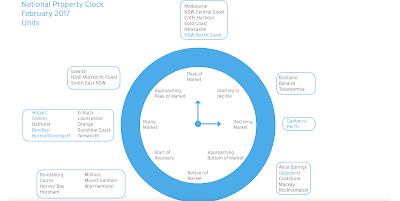 With this historic performance as a foundation, there are opportunities to get into Brisbane and hold tight that will leave you feeling very satis ed with your decision come a market cycle or two. Herron Todd White Brisbane has always been keen on well located second hand units as a strategy for those trying to get a foot on the market. They usually offer an affordable option in a great location, and while capital gains aren’t always mind blowing, good tenant demand ensures you can continue to service the mortgage without too much stress. There is, however, a very real oversupply risk looming for investor units in our city as new stock struggles to find demand. This is having a negative flow on to our traditionally solid second-hand unit market. If you buy investor-grade unit stock in particular – new or old – please tread with caution in 2017."